Many OpenGL extensions, as well as extensions to related APIs like GLU, GLX, and WGL have been defined by vendors and groups of vendors. The extension registry is maintained by SGI and contains specifications for all known extensions, written as modifications to the appropriate specification documents. The registry also defines naming conventions, guidelines for creating new extensions and writing suitable extension specifications, and other related documentation. 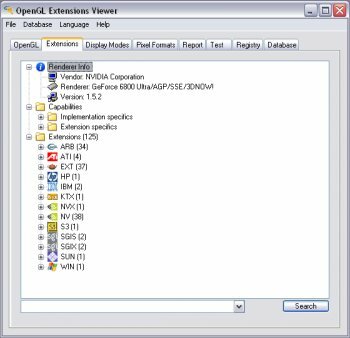 This program displays the vendor name, the version implemented, the renderer name and the extensions of the current OpenGL 3D accelerator. If you have an Internet connection, you can retrieve from SGI the extension's specifications that explain the available extensions. Installer with dutch and english language. Changed OpenGL 2.1 test using 8bit lumiance texture. ATI Catalyst version detection. Added display driver date detection. Fixed issues when OpenGL fails to initialize. httpd.confused, i am glad you managed to run the program after just a little over a year's trying and thus could give it a proper rating. Nice to know that some of you still lack reading comprehension! Thanks for your ongoing support. I couldn't do it without you! This version doesn't crash on me, at least. But it doesn't uninstall very cleanly. And sorry, but should I rate programs based on how well they work for you? You people who attempt to insult me personally simply because I rate a program poorly after it crashes on me are really sad cases. Let's see; rate software poorly, or insult another human being without direct provocation... Hmmm... Which one of these represents the behavior of a nasty individual? ^^^ Yes, my wonderful friend, I tried for an entire year to get this application to work. You're exactly right. How intuitive. And you're right; the application didn't crash because it had a bug, but rather because I didn't double click its shortcut correctly ... or something. Yes, that must be it. Thanks for the input. Nice tool! HelgeFossmo's review below is superb! There should be a Linux version as well, otherwise this project is a waste of time, IMHO. It prompted me to save a file. I came here and rated it a "1". This is really nice and it integrates so well. More of the same, please. It doesn't do much, but what it does, it does well. Does what it says it does. Very clean interface, and very informative. Haven't had any problems with it.